Episode 17: Over the years numerous explanations have been given for what Jesus meant when he talked about binding and loosing, not the least of which is that it refers to restraining demons. In episode seventeen viewers will discover that the context of Jesus’ words is that of a legal nature. 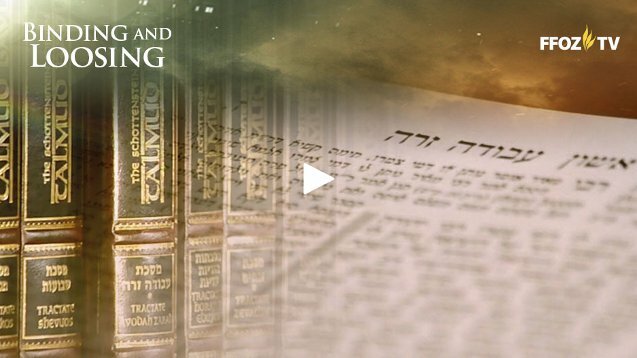 When the Jewish background to the terms “bind” and “loose” is examined, Christians can get a clearer understanding of what Messiah was teaching about. Binding and loosing in actuality refers to legal rulings in regards to the Scriptures and not spiritual warfare. Truly, I say to you, whatever you bind on earth shall be bound in heaven, and whatever you loose on earth shall be loosed in heaven. Toby told his audience that immediately after this verse was read, the people began to pray, “We bind you Satan in the name of Jesus,” suggesting that Matthew 18:18 was a description of Jesus giving the disciples the power to “bind Satan.” I immediately thought of my recent commentary on John MacArthur as well as my conversation with my Pastor on the matter, and how both seem to take the point of view that people can’t really summon the power of the Holy Spirit to make any effective spiritual or physical changes in our world. Toby brought up an interesting and useful point to this issue. If Jesus gave his disciples (i.e. “us”) the power to “bind Satan,” why would he give us the power to “loose” him as well? It doesn’t make sense. I’ve accused Christian Bible studies before about “cherry picking” specific verses in the Bible to create a particular picture or doctrine and Toby showed us how true this can be. He deconstructed this passage to show us what really seems to be happening here. “If a brother sins against you” indicates that an infraction has occurred within the congregational body, committed by an individual. The procedure of adjudicating the infraction is outlined in first the direct witness approaching the sinner, then with several witnesses, and finally the entire congregation. If the sinner continues to refuse to repent through each stage of adjudication, the congregational leaders have the authority to remove the sinner from their midst. A single witness shall not stand up against any man for any iniquity or for any error, regarding any sin that he may commit; according to two witnesses or according to three witnesses shall the matter be confirmed. The sequence of events described in Matthew 18:15-20 references a legal proceeding. If an infraction, error, or sin is committed, a set of legal steps is set in motion. First the individual who was offended may attempt to settle it privately, but if that isn’t effective, then two or three witnesses are brought in. Finally, if the matter cannot be settled, the entire congregation makes a decision to set the sinner out. The two or three witnesses, according to Toby, are actually the authorities within the community who are acting as judges. Of three witnesses, at least two or all three must agree for any legal decision to be binding. This is how a Beit Din of Jewish Rabbinic court operates today. Jesus was giving his disciples the authority to make binding legal decisions for the Messianic community of “the Way.” This is also mirrored today in more than one Christian church system where the board of deacons, elders, or directors make authoritative decisions for the entire church. Clue 1: Jesus’s words about “binding” and “loosing” occur in a legal context. I was (again) struck by the fact that the church can (quite often) misunderstand the Bible in general and the New Testament writings in particular by ignoring the Jewish cultural, historical, and legal context of scripture. Even fundamentalist and literalist Christians will miss important and even critical details by failing to take the “Jewishness” of the Jewish scriptures (i.e. the Bible) into account. The scene shifts to FFOZ teacher and translator Aaron Eby in Israel in search of our second clue. 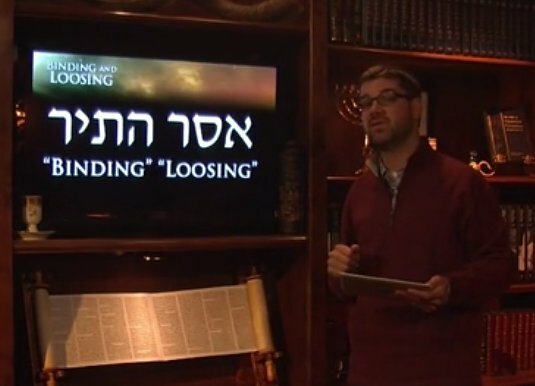 He takes us through a small vocabulary lesson about the Hebrew words for “loose” and “loosed” as well as “bind” and “bound.” The Hebrew words for “loose” and “loosed” are understood as “prohibit” and “prohibited.” The Hebrew words for “loose” and “loosed” correspond to “permit” and “permitted” (Aaron’s actual description is more detailed and you’ll have to watch the episode to get all the information). For instance, an Israeli “No smoking” sign in Hebrew can be literally translated as “Smoking is bound” or “prohibited.” Aaron also tells us that in religious Judaism, a particular Rabbi can prohibit or “bind” a particular activity as well as “loose” or permit an activity. A Jewish person unfamiliar with the rulings on a specific topic can consult a Rabbinic sage and receive a judgment on whether it is bound or loosed (prohibited or permitted) but it is bound (prohibited) to go from Rabbi to Rabbi in search of a favorable legal opinion. I will give you the keys of the kingdom of Heaven, and all that you forbid on earth will be forbidden in heaven, and all that you permit on earth will be permitted in heaven. Amen, I say to you, all that you forbid on the earth will be forbidden in heaven and all that you permit on earth will be permitted in heaven. If a matter is legally decided by two or three judges or authorities within the congregation on earth, then it will be supported by the Heavenly authority as well (which makes me wonder how all that works today with so many different and contradictory Christian and Jewish groups, each issuing authoritative legal rulings for their congregations…which one(s) does/do Heaven support?). Clue 2: “Bind” and “Loose” are figures of speech in the Hebrew. 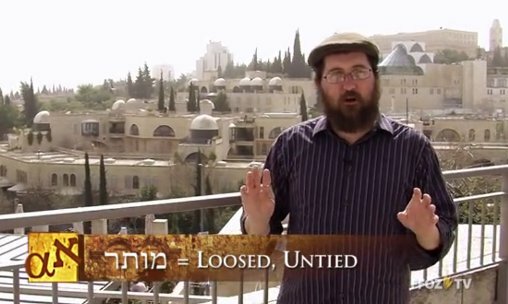 I probably would have said that “Bind” and “Loose” are legal terms in ancient and modern religious Judaism, but you get the idea. I was wondering why Toby needed a third clue since it seemed to me the point was well made, but he continued by quoting from the Mishnah an example of a legal ruling about fruit grown in Israel, which needs to be tithed, or grown outside Israel, which does not need to be tithed. I’ll skip the details because you will want to watch this episode without knowing everything it teaches ahead of time. Toby also referenced Acts 15 where the Messianic community exercised their authority to bind or loose in relation to the question of whether or not Gentiles could be allowed into the community without converting to Judaism. Should Gentiles by bound or prohibited from formal entry until they legally converted, or should they be loosed or permitted to join without such a conversion? 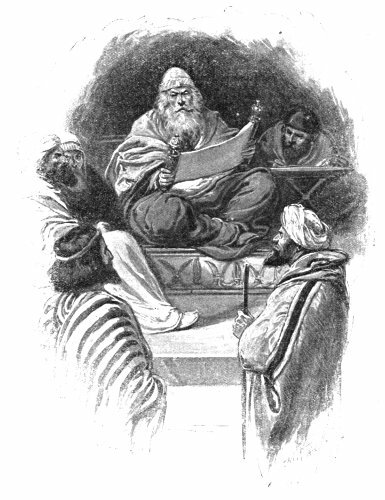 An examination of the Acts 15 process (and remember, Luke only recorded a small summary of what was assuredly a much longer and involved proceeding) illustrates the matter of deliberations by those who possessed the authority given them by the Master, and the ultimate decision was to loose the Gentiles from conversion and full Torah obligation, although they were bound to what we refer to as the “four essentials” in order to enter (as an interesting exercise, you can try reading Acts 15 and see if you can determine the actual authorities involved [two or more judges] in making the legal ruling about the Gentiles). Clue 3: Examples from Rabbinic literature and the New Testament support the two previous clues and their conclusion. Toby further references Isaiah 11:3-4 to establish that Messiah will also “bind” and “loose” during his reign as King and Judge, as well as Isaiah 2:3-4 to make a similar illustration. At the end of the episode, Toby made a point of trying to “smooth things over” for whoever in his traditional Christian audience might be disappointed that they didn’t really have the power to “bind Satan” based on Matthew 18:18. He reminded everyone that elsewhere in scripture, Jesus gave the disciples the power to cast out demons, and in Revelation 20:1-2, Satan will be literally bound. I again thought of MacArthur and my Pastor, both of whom probably never believed that Christians have had the power to bind or cast out demons after the close of Biblical canon. I was again taken by the fact that without an understanding of the first century Jewish Rabbinic, legal, and religious context and comprehension of the words of Jesus, it is quite possible and likely that the Church misunderstands large portions of the Biblical text. This supports my ongoing discussion with my Pastor that we grossly misunderstand Paul in those sections of scripture where he seems to denigrate the Torah and call for its practice to be abolished or “put on hold” by Jewish and Gentile disciples (not that the Gentile disciples were ever “bound” to Torah in the manner the Jewish people were). Since the word “halachah” refers to a way of walking, this also seems to link up to learning the legally binding methods of behaving in worship and devotion to the God of Jacob. In Messianic days, we, the “many peoples” from the nations, will go up to the “Mountain of Hashem,” the Holy Temple in Jerusalem, and learn the Torah of God from Messiah. I’ve mentioned before that I believe the Acts 15 halachic decision binds Gentiles differently to the Torah than it does Jews, but it will be interesting to see how or if any of that changes once Messiah is ruling from the Throne of David in Jerusalem. I can’t wait to find out. While I rarely defend pentacostal or charismatic doctrines, I will offer a small clarification of “binding and loosing” with respect to HaSatan or to demons. While regrettably these believers rarely have any inkling that such an interpretation is in the realm of “sod”, there actually is a defensible interpretation that places an “issur” binding prohibition upon specific satanic activity in an individual, much as HaShem constrained HaSatan in several stages from his harassment of Job. Similarly, an individual may need to be “loosed” or “delivered” from such harassment or oppression and permitted to regain their previously inhibited freedom of choice and operation. I’m not defending by this interpretation any of the common procedures employed by any given pentacostal or charismatic group or individual; and, in fact, I suggest that procedures for any such sod-istic binding or loosing should reflect the legal model described above in this topic presentation. It should likewise be recognized that such cases should be rare and extraordinary rather than normative or everyday, and based on highly refined diagnostic discernment. It may have been much more common in the semi-pagan magic-laden environment to engage actual demonic oppression than in the current era, but situations do change across the span of time and some trends of “modern” or post-modern society may again come to reflect first-century problems. I doubt that most Christians using “bind” and “loose” relative to evil powers are sophisticated enough in their knowledge of “sod” to grasp all of the implications, and agree that we should probably stick to the more concrete legal context. Also, the television show is more or less “Messianic Judaism 101” written for a traditional Christian audience, so throwing them too many curve balls would just be confusing. So, while claiming that in Matthew 23, the Halacha of the Pharisees is to be followed, the Apostles in Acts 15, did not follow the Halacha of the Pharisees and instead created their own, disobeying the Pharisees… Apostolic authority trumps, Pharisaic authority, If I understood you or FFOZ, correctly, that is the conclusion. I’m afraid you misunderstand the Pharisees, and their halakhah, Zion. Similarly, you seem to misunderstand the role of the individual rabbi’s determination of a ruling for the community under his responsibility and how that ruling is ultimately reviewed and debated on a wider level. A ruling may be relegated merely to local custom if it is not accepted more widely by other rabbis and their communities as representative of the best current application of Torah. It is not a conflict between competing rabbinical groups or their communities, whereby one would “trump” or overrule another. If a halakhic conflict were to arise, as when multiple communities interact and exchange members by means of marriages or relocations, there are rabbinic means to resolve the differences. The entirety of Talmud is a “snapshot” of that process. Regrettably, for historio-political reasons, the issue of non-Jews becoming integrated into a Torah-friendly environment that did not require them to become Jews never received the attention it deserved on the wider halakhic level. While the Pharisees were noted for enthusiastic proselytization, they also discouraged proselytes who were deemed insufficiently committed or insincere. They did not imagine that the entire non-Jewish world should become Jewish. Rav Shaul seized upon this as a reflection of prophetic passages that envision the redemption of the non-Jewish world, as non-Jews. The Acts 15 decision was not contrary to halakhah; it merely challenged an existing custom by emphasizing the notion that non-Jews could be cleansed and have access to HaShem without becoming Jewish. Rav Shaul’s letter to the Galatian communities did not view conversion per se as contrary to trust in the Messiah; the problem was that a wrong approach, that viewed conversion as required, removed their focus from the redemption of non-Jews in the Messiah and placed it onto a misguided alternative which in their situation was denying the effectiveness of the Messiah for non-Jews. I have a pastor friend who disagreed with this interpretation of binding and loosing when he viewed this same teaching that is presented in the HaYesod video series. Actually I think he saw what Yeshua was saying in a legal context but he interpreted it as an only an “example” of the authority we have to bind the powers of evil. He response was sort of “yeah, but we still have authority over the devil”. I understand his view since I came to know Messiah in a pentecostal environment and spent many years there and still associate with many people who have this view.. I know that this is an important part of their theology and the ability to “bind and loose” as well as to “command” things to be done in the spirit realm is essential to their view that the “real battle” takes place in that realm and we have a responsibility to “enforce” the will of God in our world. They usually quote the section of Scripture “we don’t wrestle against flesh and blood” to prove their point. Like many other things, I think there is a kernel of truth in their view but I no longer agree that it goes to the extreme that they take it to. I prefer to interpret it more “in context” and try to understand it as Yeshua’s audience probably did in His time. Anyway, this is an interesting anyalsis of a controversial teaching in the Church. Good job James. Is there a contradiction, Zion? The halachah of the Pharisees didn’t cover the specifics of admitting Gentiles into the Messianic community of “the Way”. Also, while the Way seems to have had many things in common with the Pharisees (belief in the resurrection for one), they weren’t identical. Yet there may have been sufficient overlap between the Pharisees and the Messianic movement. Yeshua was acknowledging that the Pharisees had the authority to establish binding halachah, but each of the different streams of Judaism of that day created binding halachah for their individual branches of Judaism. Does one branch of first century Judaism trump another? If the will of God is to be believed relative to Yeshua, then I’d have to say it was God’s desire for all of His people to follow Messiah and to join “the Way”. This brings up very interesting implications regarding today’s different branches of Judaism. While Jewish allegiance to Messiah must be part of God’s plan, does what was said above indicate that other Jewish religious streams are equally entitled to establish and maintain halachah binding on their own communities and that this is “OK” with God? The issue is controversial and could be argued from either side. Is there a contradiction, Zion? If there wasn’t, I would have never asked. The halachah of the Pharisees didn’t cover the specifics of admitting Gentiles into the Messianic community of “the Way”. Also, while the Way seems to have had many things in common with the Pharisees (belief in the resurrection for one), they weren’t identical. Yet there may have been sufficient overlap between the Pharisees and the Messianic movement. Yeshua was acknowledging that the Pharisees had the authority to establish binding halachah, but each of the different streams of Judaism of that day created binding halachah for their individual branches of Judaism. Two problems here, if each community can have its own binding Halacha, then the Pharisaic Halacha is moot. If the Pharisaic Halacha is binding, then they could not be brought into entrance without following the standard protocol of Pharisaic entrance. Since the Pharisees in Acts 15, expected the Halacha to be followed, they wanted the gentiles to go through the proselyte ritual, the Apostles disagreed, and thus disregarded the Pharisaic halacha. Then again, we are now saying the Pharisees are trumped by the Messianic community. Many within Messianic circles, argue for a continuation of Pharisaic authority as one continuous line, all the way down till today, this puts their beliefs at fault. I think it is safer to say, that when Yeshua referred to the Authority of the Pharisees, it did not mean ‘carte blanch’ as is stated and believed by some Messianics today. Thanks, Mel. In the video, Toby made a point that there are other portions of the Gospels where Jesus gave the disciples authority over demonic forces, but I think it’s important to look at the legal aspects of “binding and loosing” in order to get a better “Jewish” view of the teachings of Messiah. The concept of Jesus giving legal authority to the disciples and apostles and that such authority would be acknowledged in Heaven just as it is on Earth is really something to grasp and, as I said above, the implications relative to Jewish halachah in our present world are something to ponder. I appreciate the complement, Mel. Hope you and yours are doing well. Zion, I think you missed my comments about “overlap” between the Pharisees and the Way. As far as Yeshua and Matthew 23 is concerned, I read an interesting paper by Noel S. Rabbinowitz that comments on this and that you might enjoy. Here’s the link (PDF): Matthew 23:2-4: Does Jesus Recognize the Authority of the Pharisees and Does He Endorse Their Halakhah. Rabbinowitz can probably make a better point on the matter than I can in a short summary here in the comments section of this blog post. I have already read his article, and agree for the most part, he acknowledges that not everything taught by the pharisees is bounding, thus making Halacha debatable and a select-able choice, per a community, and not a ‘carte blanch’ Deut 17 fulfillment, as sadly, argued by a few. Time to give the poor horse a rest. Agreed. I read this many years ago in one of the, “Difficult Words of Jesus,” books by David Bivin and Roy Blizzard. Perhaps we should keep in mind that divinely appointed servant-leaders in each local congregation were given the ability to make these binding legal rulings that applied only to the persons under their care. You can see where every self-appointed and self-anointed, “leader,” could run with this and claim authority over others. Yes, certain persons who had seen Yeshua in the flesh were given greater authority to oversee their talmidim in several localities, and it seems to specifically be focused on teaching gentiles, who had no basis of teaching in truth and had to unlearn much in the way of pagan beliefs and practices. You could also see that many of the first century “churches” Paul “planted” in the diaspora may have developed minor (or not so minor) alterations in their halachah to meet local requirements or circumstances. To the rest I say this (I, not the Lord): If any brother has a wife who is not a believer and she is willing to live with him, he must not divorce her. We’re fortunate to have this recorded in the Bible, but how many local rulings and customs were developed in individual communities that have been lost to history? That seems to be sort of what I was trying to say, but I don’t have the background to articulate it as well as you to, PL. Thanks. PL, you are simply putting a spin on words, the Halacha was in contradiction, as we see in Acts 15:1, that it was stated that one could not be “saved”, without the ritual of the proselyte, which is not correct, invalid and absurd, putting the proselyte ritual into conflict with the Gospel. If you say that they misunderstood the proper “proselyte ritual” and you can teach it a different way as you suggest, then you are still saying the Pharisees teaching in this regard was still in conflict with the Gospel. Sorry, Zion, words are all we have by which to pursue understanding. If you wish a better understanding of the social situation in Galatia to which Rav Shaul directed his comments against the fallacy that conversion would solve the conflict they felt they faced, and its negative impact on the good news that the Messiah could cleanse non-Jews without turning them into Jews, I recommend that you read Mark Nanos’ book “The Irony of Galatians”. You still fail to grasp the difference between halakhah and minhag (custom), that you should put the spin that you do upon the conflict resolved in Acts 15 and depicted in the Galatians letter that had been written some years before that decision. At issue is not a conflict with Pharisaic halakhah, but rather which aspect of halakhah is appropriate to apply to this particular situation. It is not “all this way” against “all that way”, but is rather more nuanced, just like any legal investigation whose purpose is to obtain justice. It is not unlike some of the halakhic arguments Rav Yeshua engaged with various Pharisaic groups, in which there was disagreement about perspective and thus about what should be the proper halakhah to derive from Torah or to apply to some classic exemplary situation. Don’t invent a conflict where none is needed to exist. In Acts 15, Peter concludes an answer that involves both Jews and Gentiles, not just gentiles, the only way your argument works, is if the conflict only involved gentiles, but that was not the case according to Peter’s answer. Thus making the argument not a nuanced application of how to involve gentiles, but whether or not the custom was correct to begin with, that revolving around Jewish identity as a form of salvation status, with the conclusion as invalid. Zion said: In Acts 15, Peter concludes an answer that involves both Jews and Gentiles, not just gentiles, the only way your argument works, is if the conflict only involved gentiles, but that was not the case according to Peter’s answer. That plays rather well into the traditional Christian teaching that Torah obedience was not required for Jews and Gentiles. My reading of Acts 15 (the premise of the problem was stated in verse 1) is that the Council was issuing a legal ruling specifically for the Gentiles entering “the Way.” Yes, Peter addresses justification by faith as being identical for Jewish and Gentile disciples, but that indicates that faith is the “common currency” for salvation for all human beings, regardless of differing covenant obligations to God (Jewish vs. non-Jewish). That plays rather well into the traditional Christian teaching that Torah obedience was not required for Jews and Gentiles. Did the Torah require circumcision for salvation (Jewish identity) as we see in Acts 15:1, if we are honest, we both know the Torah does not teach such a thing. The reference here then is not according to Torah, but according to custom or tradition as it states. Thus this has nothing to do with Torah obligation, as is argued by traditional Christian teaching, but instead an invalid doctrine. My reading of Acts 15 (the premise of the problem was stated in verse 1) is that the Council was issuing a legal ruling specifically for the Gentiles entering “the Way.” Yes, Peter addresses justification by faith as being identical for Jewish and Gentile disciples, but that indicates that faith is the “common currency” for salvation for all human beings, regardless of differing covenant obligations to God (Jewish vs. non-Jewish). Verse 1, does not deal with covenant obligation, it deals with salvation identity, and that is where Peter’s answer comes into play. In the context of New Testament times, I believe there were Jewish people who believed that being “Sons of Abraham” was sufficient for justification (Matthew 3:9). There’s probably where Acts 15:1 comes from. That’s also where Peter comes in to explain that everyone is justified by faith whether ethnically Jewish or not. Yes, the Jewish people of Matthew 3:9 and Acts 15:1 were wrong, but within that context, it was a legitimate theological and legal question that required a response. Yes, the Jewish people of Matthew 3:9 and Acts 15:1 were wrong, but within that context, it was a legitimate theological and legal question that required a response. I agree, as it says, the gentiles who were just turning to God, were being disturbed by these words… and the fact that it invalidated the Gospel message was nothing to ignore. We see Paul dealing with these same issues in Galatians.